In this post, Dora Vargha examines the battles over historical traditions and memories as fought out in Hungarian politics today. The refugee crisis is just the tip of the iceberg. As Jessica Reinisch pointed out in her essay, using historical precedents and applying a simplistic “history repeats itself” outlook is often more harmful than beneficial in informing public discourse and policy making. Quite rightly so, we should be wary of political commentary and reporting that does away with particular historical contexts and disregards social, cultural and political complexities of past situations: through a simple analogy, this kind of historicizing presents currents issues in a clean-cut way, which can be simplistic or downright misleading. But what happens when history is completely missing from the conversation and historical references are consistently skewed or resisted in political discourse? What is the significance of a government’s outright refusal to engage with certain historical precedents at the expense of others? 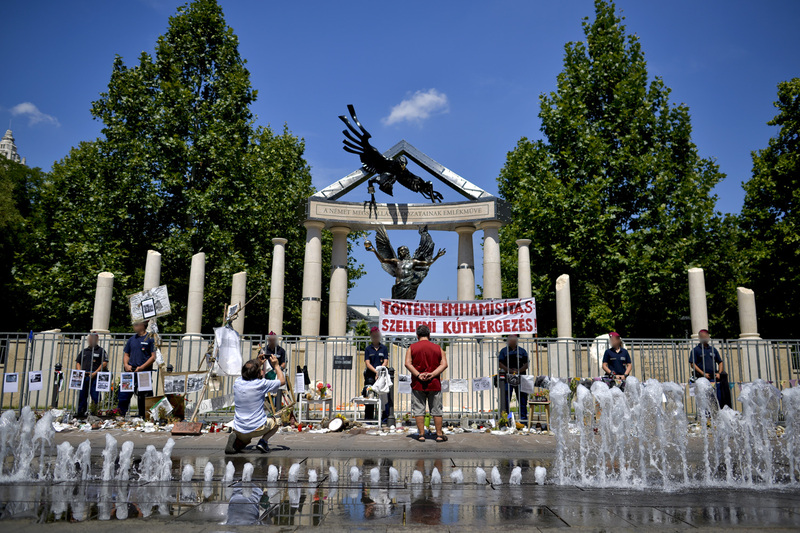 The stakes of not addressing some central historical aspects of a crisis, such as the case in the refugee situation in Hungary, are as high as those that lie in the “misuse” of historical context. In the following I take a closer look at an issue Friederike Kind-Kovacs raised in her blog post to explore these questions, particularly why, as she argues, “the Hungarian government refuses to draw any comparisons between Hungary’s own refugee crisis and the current situation that could possibly trigger feelings of solidarity or compassion”. At a closer look, the historical references and absences surrounding the refugee crisis in Hungary reveal broader questions of political ownership over certain historical events and the flexibility of historical narratives in constructing political identity. The past refugee crisis in focus is, again, the 1956 revolution in Hungary. Over 200,000 people left the country in a matter of days in the upheaval of the revolution that broke out 59 years ago on October 23. Particularly in recent months, international and Hungarian press and activists have frequently cited this historical precedent as the Hungarian government pursued anti-immigration campaigns and built a fence on the southern border of the country. Former Hungarian refugees, like the co-founder and past CEO of American computer company Intel, Andrew Grove (born András Gróf), have been put forth as examples of the contribution refugees can make to economies and societies. Moreover, 1956-ers themselves have spoken out against current Hungarian policies and practices, recalling the great importance of a welcoming hand in their plight. The reason why the story of the 1956 refugees has occupied center stage, both on the national Hungarian and international scale, is the same reason why the government of Viktor Orbán has consistently refused to participate in any conversation regarding the revolution in the context of refugees: the revolution of 1956 has always featured prominently in the self-definition of Fidesz, the popular conservative party of Viktor Orbán, which has used it as ‘their’ historical legacy throughout the past 25 years. And it is precisely this central role of the 1956 revolution in the governing party’s historical memory that can explain the silencing of this history now: any kind of engagement with the 1956 refugee narrative would bring forth questions that would challenge the party’s political identity and heritage to the core. To understand this we need to take a closer look at the current Hungarian political landscape. Hungarian national politics is built upon the historical interpretations and legacies of the fascist and communist regimes of the 20th century. Since 1989, political parties have defined themselves and criticized each other through mnemonic battles over historical legacies, traditions and precedents. As heir to the Hungarian Socialist Workers’ Party (MSZMP,) the ruling state party in the communist era, the Hungarian Socialist Party (MSZP), the largest party on the left, has wanted nothing more than to forget its past, or to at least leave it behind. At the same time, it has aimed to position itself as an important force in the democratic turn (see Gyula Horn cutting the iron curtain in 1989) and has been striving to discredit its political opponents by drawing direct lines between the late 1930s and 40s and the present, connecting the contemporary right with mid-century fascism. Fidesz, on the other hand, has aimed to represent the 1980s as another version of the Stalinist years of the early 1950s, depicted in the shape of symbolic institutions like the House of Terror Museum. Although it also has its fair share of communist party functionaries and ex-members of the politburo among its ranks,it has used this particular historical representation to delegitimize the left and strengthen its claim as the truly democratic power. It has tried to increase its political leverage in opposition to communism as a legitimate, democratic party. Most probably due to the same reasons, the two parties have been united in their resistance to allow access to secret police archives from the communist era and have consistently blocked historians’ attempts for open research. The new kid on the block, the far-right party Jobbik, emerged from the largest and most renowned History department of the country and has been building its political discourse directly on the interwar romanticism of Hungarian greatness. The fourth party in parliament, the new liberal-green LMP (short in Hungarian for Politics Can be Different), a very young party with no ties to previous regimes, has been trying to balance between left and right in its interpretation of current historical controversies. In this post-communist setting, the 1956 revolution has occupied a prominent place in Hungarian historical memory and became a foundational myth of the new democratic era. 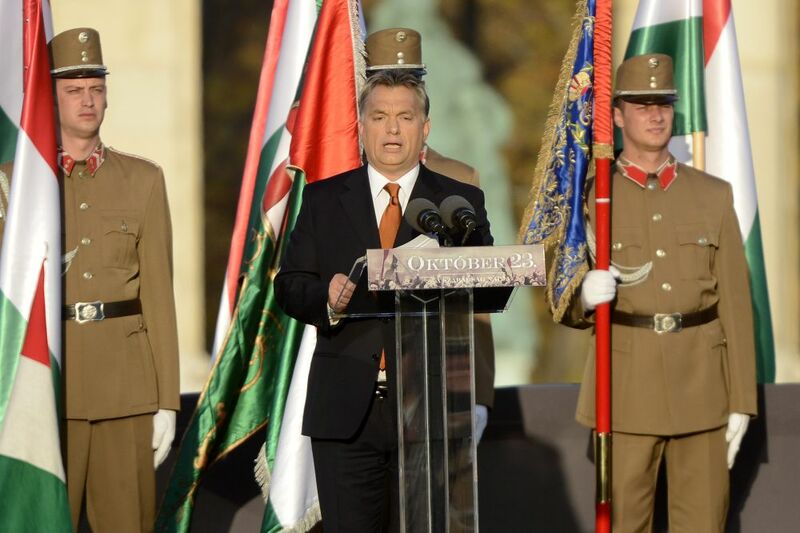 It was on October 23 that the Republic of Hungary was proclaimed in 1989, and the anniversary of the revolution has been the most important national holiday ever since. 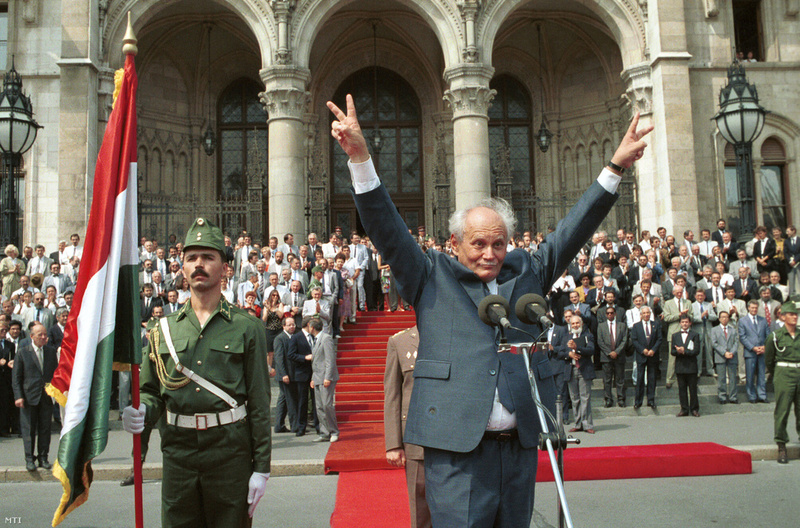 The first democratically elected president of the country, Árpád Göncz (who died recently at the age of 93), had been sentenced to life for participation in the 1956 revolution. Former revolutionaries, especially those with prison sentences, have given historical legitimacy to political parties on left and right. Year after year, October 23 has been the date for major political rallies combined with mass commemoration. On the revolution’s 50th anniversary, a right-wing rally turned into a violent protest against the governing left and was met with police brutality. It is precisely because of the importance of the revolution in the historical memory of the country, and especially of that of Fidesz, that many Hungarian critics of Orbáns’s government are reaching back to the stories of the 1956 refugees. Drawing an analogy in this case is a method of shaming, and aims to highlight that the governing party is on the way of becoming the state that it established itself against. While these analogies may be flawed in the eyes of an astute historian, they need to be understood in the particular context of how historical memory is used (and abused) in Hungary. This is also the reason why no one on the right will mention the revolution in relation to the refugee crisis. Instead, they reach far back to medieval history and pose as the protectors of Christian Europe against Muslim forces. The amnesia of all the historical circumstances when Hungarians themselves were refugees (and there have been many) serves the purpose of explaining away the lack of basic services and assistance to refugees by the Hungarian state. But this historical shift of focus also seems to be part of something bigger. The recent years have witnessed a change in Fidesz’s political use of 20th century history. Since the opposition on the left crumbled away or self-destructed, the major threat to power now comes from the far-right. The conventional anti-communist rhetoric has little use here, as the leaders and key party members of Jobbik came of age in the nineties. Political discourse has moved to meet the far-right’s claims, in this particular case with a heavy-handed anti-immigration campaign and the building of fences around the borders of the country. Historical memory, a central element in political identity, has shifted accordingly. The hallmarks of this change are not only visible on the streets in the form of interwar street names and monstrous memorials, such as the controversial Memorial for the Victims of the German Occupation. In 2012 the government dissolved the public foundation that supported the 1956 Institute, a center for historical research that had been focusing on the revolution and the era of state socialism in Hungary. A year later, a new historical research center was established: the Veritas Institute, which aims to reinterpret the history of the past 150 years “without distortion”, and operates directly under the direction of the Prime Minister’s Office. The professional community of historians is mostly appalled by these recent changes, while right wing historians argue that political involvement has been known to go the other way as well in the past. In a way they are certainly right: in Hungary history writing has been decidedly a political act in the last 25 years. The Hungarian refugee crisis has thrown light on this troubled relationship of politics and history in the country. When reaching to historical precedents or evaluating the use of historical arguments, like the 1956 revolution, we have to bear in mind that in Hungary history has not merely been used in making political claims, but it has been the essence of politics itself. Political dividing lines have been drawn around interpretations of historical legitimacy, and history figures as a foundational element in parties’ identities. Many of these deliberations are aimed at the domestic political scene and don’t make much sense outside of Hungary, as the occasional puzzlement in international press over Viktor Orbán’s statements attest to it. However, the particular way in which history is drawn upon in shaping politics and policy in Hungary does have a very real impact with very high stakes for the people who arrive at the border after a long and perilous journey, and certainly has an impact on Hungary’s political maneuvering in the European Union.